I have a shocking revelation for you: Big Food corporations are selling you food-like products they claim will improve your health. They’re taking food that was once actually food (more or less) and stripping it of nutrients, refining it, and adding artificial preservatives, sweeteners and flavors. They’re adding synthetic vitamins and minerals or other so-called beneficial ingredients and placing it in shiny packing slapped with promises that said food-like product will reduce your cholesterol or improve heart health. Do you trust a chemist in a lab or mother nature? Do you think corporations care about your health over their profit margin? Your body doesn’t recognize chemically altered foods as real food, and the additives and artificial ingredients (what is soy protein isolate anyway?) can build up in your tissues and cause endocrine disruption. The refined grains and sweeteners–yes, the ones in your instant oatmeal– contribute to cravings, inflammation weight gain, and blood sugar fluctuations. General rule of thumb: if it comes in a package, it’s likely not a health food. How many steps are removed between the food coming out of the ground and landing in your hands? Don’t believe the hype. Here is my list of fake health foods. 1) Packaged Gluten free breads, cereals, donuts, cookies, pretzels, cakes: People want to improve health by going gluten free and swap out everything gluten-filled for gluten free substitutes. This defeats the purpose. These gluten free products usually contain refined grains–oats and corn–or canola and sugars. Gluten free has become a marketing goldmine, and these products are just as processed as their gluten-filled counterparts. It’s one reason why people aren’t seeing benefits to removing gluten: They’re still getting the inflammatory refined grains and sugars in their processed gluten free products. Non-GMO INGREDIENTS (well, that’s a good start at least): Expeller-pressed natural oil blend (soybean, palm fruit, canola and olive oils), filtered water, pure salt, natural flavor, (derived from corn, no MSG, no alcohol, no gluten), soy protein, soy lecithin, lactic acid (non-dairy, derived from sugar beets), colored with beta-carotene from natural sources. Contains soy. Here’s the deal. Most vegan products are loaded with soy, which is usually GMO. Soy is cheap, versatile and adds protein and spreadability. Soy can contribute to thyroid and hormone imbalance. It contains plant-based estrogens. Soy is not a health food, especially when it’s refined and altered into soy oil or soy protein. As far as soy and vegetable oils go, they contribute to inflammation. “Buttery stick spread” or whatever isn’t a natural food. It’s a heavily processed food product. If you are vegan, use coconut butter or coconut oil as a butter substitute. The rest of us can use real butter and ghee, which have health benefits. 3) Microwave Popcorn is a chemical-filled toxic mess. Most brands of microwave popcorn are coated with artificial flavors, fake butters, hydrogenated oils (the real artery cloggers) and chemicals that line the bag: perfluorochemicals (PFCs), which are linked to thyroid disease, ADHD, cancer and endocrine imbalance. Corn is a grain, usually GMO, that many people have sensitivities to. If you must have popcorn, air pop it on the stove with coconut oil and sea salt. 4) Kashi foods: “Seven Whole Grains on a Mission,” and their mission is to take down junk food snacks. The irony is that Kashi is pure junk food, folks. They claim to use all natural ingredients, travel to the four corners of the earth to find the best ingredients, whatever. On a recent road trip, I picked up a Kashi TLC granola bar that contained the following ingredients: soy protein isolate, soy grits, canola oil, vegetable glycerin, whey protein isolate. When is the last time you saw a whey protein isolate plant? All lab processed ingredients, down to the canola (ever heard of the canola plant? It doesn’t exist). Sure, you won’t find any partially hydrogenated oils or high fructose corn syrup, as they claim, but these ingredients are far from all natural. 5) Skim Milk: aside from the fact that conventional milk is pasteurized, destroying all enzymes and health-promoting nutrients, skim milk has been additionally processed, the fat stripped away so you’re left with a watery, low fat, highly processed and inert watery beverage. Nature intended for milk to be packaged with its fat because its main vitamins, A & D, are both fat soluble, meaning they need to be consumed with fat to be absorbed by the body. Also, fat is not the enemy. You need fat for brain & cellular & skin health. Skim milk is just gross, and it is not a health food–it’s basically sugar water. If you tolerate dairy, seek out raw whole milk, brimming with immunoglobulins for a strong immune system and healthy gut. 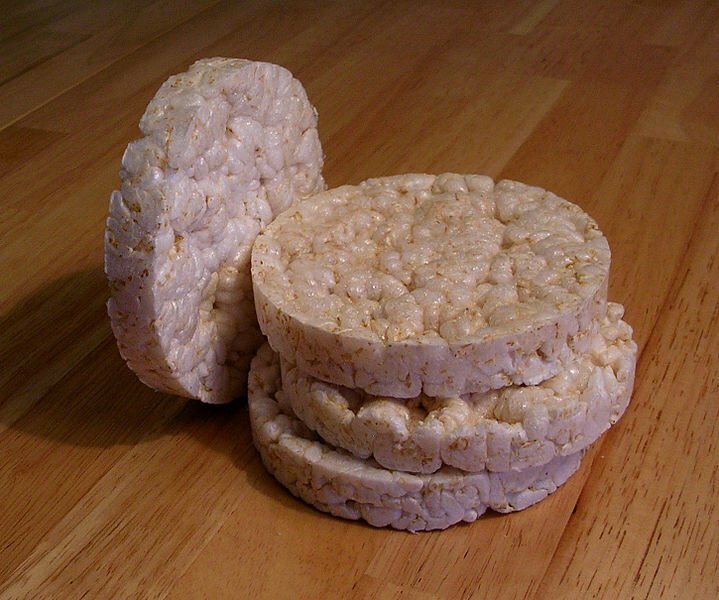 6) Rice Cakes: one of my faves to pick on. The methods by which the rice is puffed denatures the protein in the rice, changing the composition of the food, and rendering it processed; there is nothing natural about a rice cake. Aside from the fact that they taste like styrofoam, most have added sugar, and some even have corn syrup, which is worse than sugar due to the processing methods. If you need a quick crunchy snack, grab some mineral and flavor-rich kale chips. TEXTURED VEGETABLE PROTEIN (SOY PROTEIN CONCENTRATE, SOY PROTEIN ISOLATE, WHEAT GLUTEN, WATER FOR HYDRATION), BLEACHED WHEAT FLOUR, CORN OIL, CORNSTARCH, CONTAINS TWO PERCENT OR LESS OF WHEAT STARCH, SALT, METHYLCELLULOSE, MODIFIED CORN STARCH, DEXTROSE, AUTOLYZED YEAST EXTRACT, NATURAL AND ARTIFICIAL FLAVORS FROM NON-MEAT SOURCES, SUGAR, MALTODEXTRIN, DISODIUM INOSINATE, SOYBEAN OIL, HYDROLYZED SOY PROTEIN…..
Aside from processed soy, these contain MSG (modified starch, AUTOLYZED YEAST) and a whole lotta chemicals. If you are going to be a vegetarian or a vegan, avoid processed/packaged fake meats and cheeses. I like the article however in #4 it says that canola plants don’t exhist? Not sure what you mean by this. I live in saskatchewan and there massive amounts of canola crops here. Canola is not the name of a plant. Canola comes from the seeds of the rapeseed plant. It is called canola in Australia, not rapeseed…. I buy Lundberg Organic Brown Rice Cakes – 1 ingredient: organic brown rice. Still no good? As I mention in the article, “the methods by which the rice is puffed denatures the protein in the rice, changing the composition of the food, and rendering it processed; there is nothing natural about a rice cake.” This applies to the processing methods of the rice itself, so even if rice is the only ingredient, the denatured protein is still an issue. Cant believe you are trying to tout Coconut oil as being healthty. It is a saturated fat pure and simple . All the recent press on coconut oil has just tried to elevate its status , Just not the type of fat we want to promote . Also sea salt , no better that sodium chloride Equally as bad for a person as salt . Just want to clear up some myths !!!!! I am very saddened to see the initials “RD” after your name, meaning you are a registered dietician. Please, please go back and educate yourself before you continue to spread dietary lies to others. Saturated fat IS healthy. Your brain is 70% fat and your cell membranes need it for permeability (so nutrients can get inside). The real cause of heart disease and high cholesterol is sugar. Sodium chloride is refined salt (refined with chemicals) and can raise blood pressure. Sea salt is high in trace minerals the body needs and contributes to balanced blood pressure. I sincerely hope you engage in some continuing education for the health of your clients. I assume the same is true of organic brands like Lundberg brown rice cakes? Yes, true of all rice cakes. It’s the processing methods that are problematic, as it denatures the rice.